Users of modern phones search for tips to improve battery life of their phones. Modern smartphones are phones with small computers under the cover. 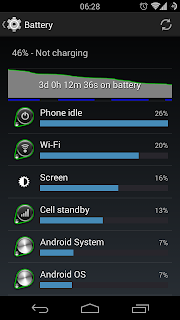 Battery consumption is high and this is one of main disadvantages of modern phones. Before we list suggestions, you have to check what has been using your battery. Simplest way is with integrated tool (Settings/Battery). If you find any strange results, you can maybe remove the suspicious application, change settings or change it with another application... If you don’t know the application listed, take some time and browse for it. It can be just one of Google services. After you have found biggest gulper, you can pay attention to following battery saving tips and suggestions. Screen is usually the biggest gulper and reduce the screen brightness is one of the most important step. Maybe you can disable Auto brightness and reduce the brightness. If I’m inside, my Nexus 5 can be used with 3%. Let your phone sleep (Settings/Display) as fast as it is comfortable for you. I’m using 30 seconds. Widgets on your screen works all the time. Some of them checking weather every minutes, sending your location to cloud, reading your calendar, checking sports news… All this takes CPU time, uses connection, GPS and so on. 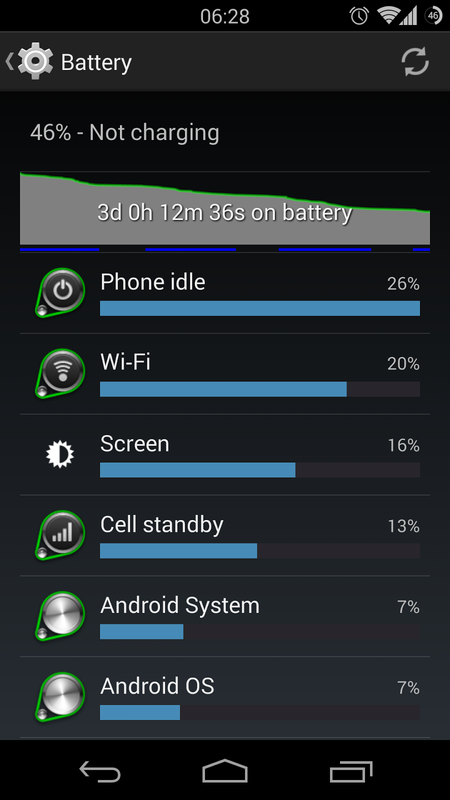 This results in using more battery juice. Think if you need all of them or at least check if you can change settings for updates (do you really need one minute weather checking?). Use static wallpaper instead of live wallpapers. If your phone has AMOLED, it is also important that your wallpaper is black. Google sending your location for better user experience (smile) – Google Now, Gmail, Google+ and many more are using this. 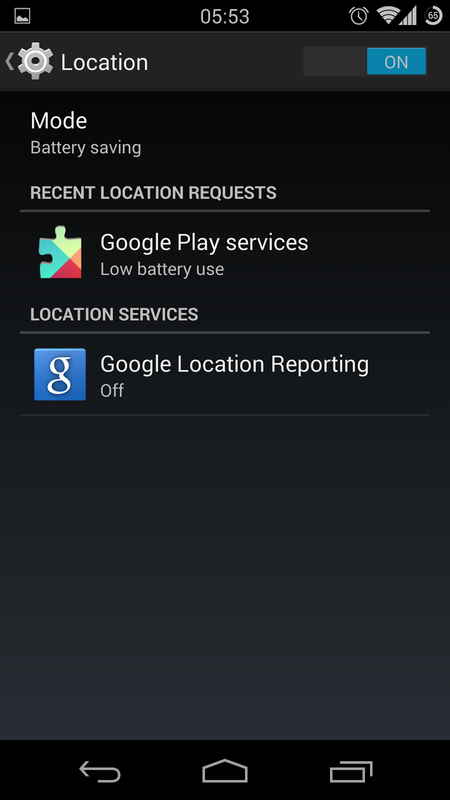 Turn “Settings/Location/Google Location Reporting” to off, and you will see a big saving of your battery. If you don’t need a GPS, I suggest to set “Settings/Location/Mode” to “Battery saving”. This will also help. Many applications (Twitter, Facebook…) want to sync something all the time. Check if you need all of it. Check “Settings/Accounts/Google” if you need all from Google account to synchronize (Photos, Keep, Drive …). Maybe you can disable Auto-sync and simply check email when you want (with Auto-sync phone will notify you when email comes). Auto-sync consumes a lot of battery. Turn off NFC if you don’t need it (Settings/More/NFC). If you don’t use data, you can set “Settings/Wireless&networks/Mobile networks/Preferred network type” to 2G. Especially if your mobile signal isn’t good and you use just phone over your phone mobile provider, you can set 2G. And if you are at home, you can still use your Wifi for networking. And don’t forget - poor signal strength consumes more battery! If you don’t use wireless/bluetooth for the whole day, it is recommended that you turn it off. Believe it or not - tiny phone vibrations uses battery juice. You can stop here, but here are some more suggestions. I’m using Cataclysm ROM (on Nexus 5) and Franco Kernel (on Nexus 5). 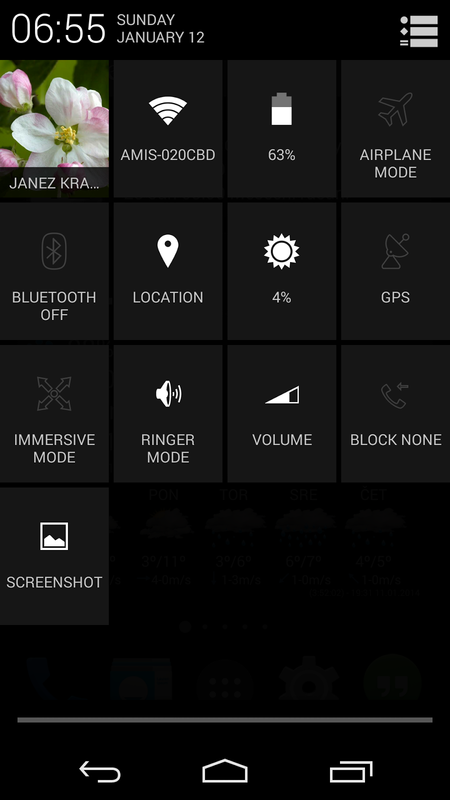 Customization of toggles in Cataclysm ROM are great. Many of above written tips are simply changeable with one click. So disable/enable any of battery consumption things are just a moment away. The other good feature is Smart radio. If you don’t use a network at the moment, Cataclysm ROM will lower network connection from 4G -> 3G -> 2G. After you start to use an application with network, ROM will raise speed again. If you use custom kernel (like Franco Kernel), you will find many settings for changing phone behavior. I hope that suggestions from this article will help you. This tips is so much learn-able. Thanks for shearing this.